It takes something extra for a dog biscuit to be called Eukanuba. Vital Health System™: Eukanuba Biscuits are recommended to be fed as a treat to complement the Eukanuba Vital Health System of our dry dog food products. 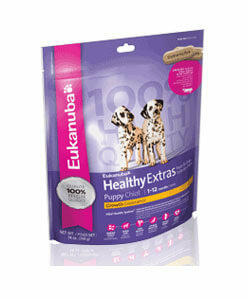 At Pets Meat Supplies we stock all Eukanuba Treats and Extras for Puppies and Adults.